A loss-of-function mutation is ‘a mutation that results in reduced or abolished protein function’.2 A gain-of-function mutation has been defined as ‘a mutation that confers new or enhanced activity on a protein’.3 A good understanding of these two types of mutations can be gained by examining mutations in the gene coding for a receptor located on thyroid cells and how these changes affect the control of thyroid hormone levels in the body. The thyroid hormones, triiodothyronine (T3) and thyroxine (T4), affect essentially every tissue in the body. These hormones are necessary for maintaining an appropriate basal metabolic rate and are produced by the thyroid gland located in the front of the neck (figure 1, right). 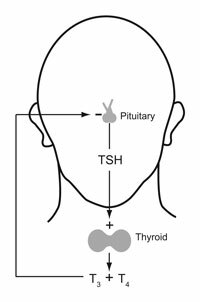 Thyroid stimulating hormone (TSH), a glycoprotein secreted by the pituitary gland in the brain, binds with the TSH receptor on the surface of the thyroid follicular cells. This initiates a series of biochemical events that result in an increase in circulating thyroid hormone. A gain of … what? Figure 2. In addition to controlling the output of thyroid hormone, the TSH receptor is part of a second biochemical pathway that regulates the growth and development of cells in the thyroid gland.5 Mutations in the genes coding for such proteins can often lead to the development of cancer. (Click on picture to see a higher resolution version). After: National Cancer Institute (US). Activating mutations have also been described in cases of sporadic hyperthyroidism and thyroid cancer (carcinoma—see figure 2, right).7 At this point it should be apparent that the ‘enhanced activity’ mentioned in the definition has an unwarranted positive connotation. Activating mutations may result in more product, but they don’t result in something more valuable.11 Instead, there is a loss of control of a pre-existing biochemical pathway. Living things depend on being able to maintain homeostasis, or a balance. 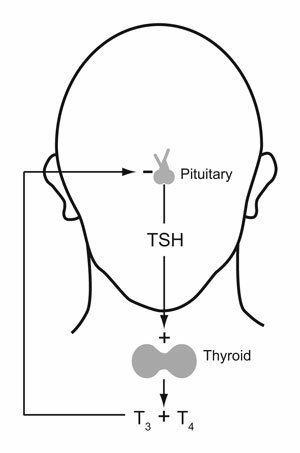 Although the pituitary responds to the high thyroid hormone levels by decreasing TSH release, it has no effect on the constitutively active receptor. The excess thyroid hormone doesn’t ‘enhance’ anything, it causes disease. Even though very rarely a protein with promiscuous activity may prove beneficial under special circumstances, still the loss of specificity represents a downward change in the genome. One gain-of-function mutation is different and results in a protein with a ‘new function’. In this case the mutation alters the receptor so it responds to human chorionic godadotropin (HCG). HCG is a hormone that increases early during pregnancy to help maintain the pregnancy. While HCG naturally stimulates the TSH receptor to some degree in early pregnancy, the mutation causes the receptor to be so sensitive that overt gestational hyperthyroidism develops.12 Again, the pituitary responds to increased thyroid hormone by decreasing TSH, but since the receptor is responding to HCG this doesn’t solve the problem. When a protein loses its specificity and becomes involved in reactions it wouldn’t normally be involved in, it has a ‘new function’. This is often referred to as promiscuous activity. Even though very rarely a protein with promiscuous activity may prove beneficial under special circumstances, still the loss of specificity represents a downward change in the genome.13 It is impossible to build complex pathways with appropriate feedback mechanisms by randomly introducing errors. 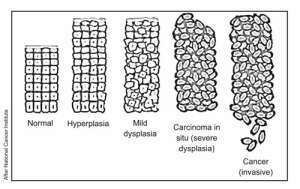 It is worth noting that mutations produce new alleles (variant forms of a gene) and certainly add variety. However, molecules-to-man evolution requires the generation of new information to build new, complex, interdependent biochemical pathways. Despite the deceptive wording found in the gain-of-function definition, there is no increase of information or improvement of biochemical pathways. 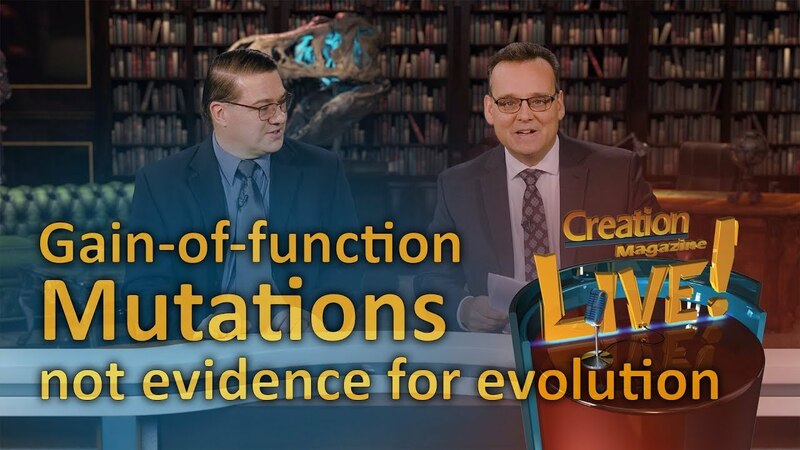 Without a mechanism for developing such pathways, evolution is nothing more than a myth. Instead, what we observe fits exactly with what we would expect if the Bible is true. Living things are very well designed. Errors introduced by mutations do not build new, well integrated biochemical pathways; instead they often cause disease. Can biologically active sequences come from random DNA? 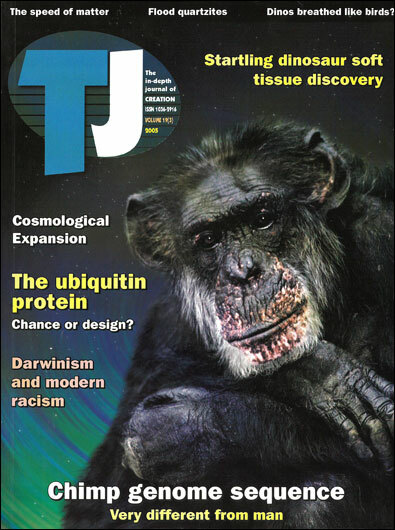 <www.public.iastate.edu/~zool.433/genetics.htm>, accessed 9 September 2005. Return to text. <www.medterms.com/script/main/art.asp?articlekey=39612>, accessed 9 September 2005. Return to text. <www.medterms.com/script/main/art.asp?articlekey=39613>, accessed 9 September 2005. Return to text. The control of thyroid hormone level in the body is actually far more complex than this. The body must also respond to external temperature and other internal signals to maintain proper hormone levels. Return to text. Nussey, S. and Whitehead, S., Endocrinology: An Integrated Approach, BIOS Scientific Publishers Ltd., Oxford, UK, 2001. 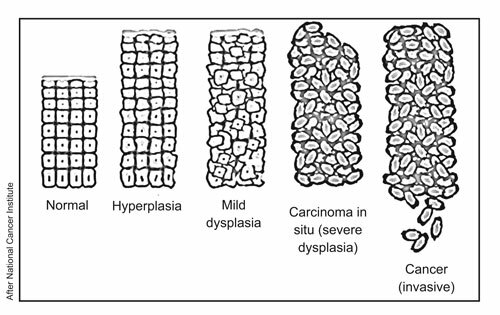 <www.ncbi.nlm.nih.gov/books/bv.fcgi?rid=endocrin.chapter.235>, accessed 9 September 2005. Return to text. Alberti, L. et al., Germline mutations of TSH receptor gene as a cause of Nonautoimmune Subclinical Hypothyroidism, J. Clinical Endocrinology and Metabolism 87(6):2549–2555, 2002. Return to text. <www.uni-leipzig.de/innere/tsh/frame.html>, accessed 1 June 2006. Return to text. Alberti, L. et al., A novel germline mutation in the TSH receptor gene causes non-autoimmune autosomal dominant hyperthyroidism, European J. Endocrinology 145(3):249–254, 2001. Return to text. A dozen different heritable gain-of-function mutations have been described out of nearly 4 dozen different gain-of-function mutations in the TSH receptor gene. Generally, loss-of-function mutations are more common, but that doesn’t appear to be true of this particular gene when somatic (non-heritable) mutations are included (ref. 7). Return to text. Goitrogens are substances which suppress thyroid function. Examples include calcium and fluorides in drinking water and compounds found in certain foods such as cabbage, cassava and brussel sprouts; <http://www.fpnotebook.com/END217.htm>, accessed 31 May 2006. Return to text. Elsewhere, the same online dictionary describes gain-of-function mutations as conferring ‘an abnormal activity on a protein’. This is accurate; <www.medterms.com/script/main/art.asp?articlekey=39612>, accessed 9 September 2005. Return to text. Rodien, P. et al., Familial gestational hyperthyroidism caused by a mutant thyrotropin receptor hypersensitive to human chorionic gonadotropin, New England J. Medicine 339(25):1823–1826, 1998. This is distinct from a molar pregnancy, where hyperthyroidism is induced by excessively high concentrations of HCG. Return to text. Lightner, J., Special tools of life, 12 May 2004. The three mutations described in this web article would be defined as gain-of-function mutations. Although the second mutation, resulting in a loss of specificity in ribitol dehydrogenase, effected a greater loss of activity toward ribitol than gain of activity toward xylitol, it is still by definition a gain-of-function mutation (due to its activity toward xylitol). While none of these mutations truly increase information within the genome, these types of mutations likely have played some role in animals adapting to new, harsh environments since the Fall. Notice that they enable the organism to survive under unusual conditions, yet significantly decrease the fitness of the organism under most circumstances. Return to text.